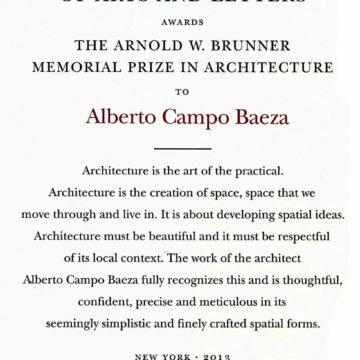 The Spanish architect Alberto Campo Baeza is the recipient of the ARNOLD W. BRUNNER MEMORIAL PRIZE 2013 by the AMERICAN ACADEMY OF ARTS AND LETTERS. After the PRITZKER, this is the most prestigious award handed down by the American Architects. This is the fourth major prize Alberto Campo Baeza receives this year. Having picked up the UPM Prize for Excellence in Teaching in Madrid on January 25th and the Heinrich Tessenow Gold Medal in Hamburg on January 30th, and the International Award Architecture in Stone 2013 on April, in Verona, he received in May, in New York, this latest prize. The Arnold W. Brunner Memorial Prize was bestowed on Louis I. KAHN in 1960. Almost all PRITZKER prize-winners were previously honored with the Arnold W. Brunner: Gordon BUNSHAFT in 1955, I.M. PEI in 1961, Kevin ROCHE in 1965, Richard MEIER in 1972, Robert VENTURI in 1973, James STIRLING in 1976, Franck O. GEHRY in 1983, Tadao ANDO in 1991, Norman FOSTER in 1992, Rafael MONEO in 1993, Renzo PIANO in 1994, Alvaro SIZA in 1998, Fumihiko MAKI in 1999, Kazuyo SEJIMA and Ryue NISHIZAWA in 2002, Hans HOLLEIN in 2004, Jean NOUVEL in 2006, Peter ZUMTHOR in 2008 and TOYO ITO in 2000. 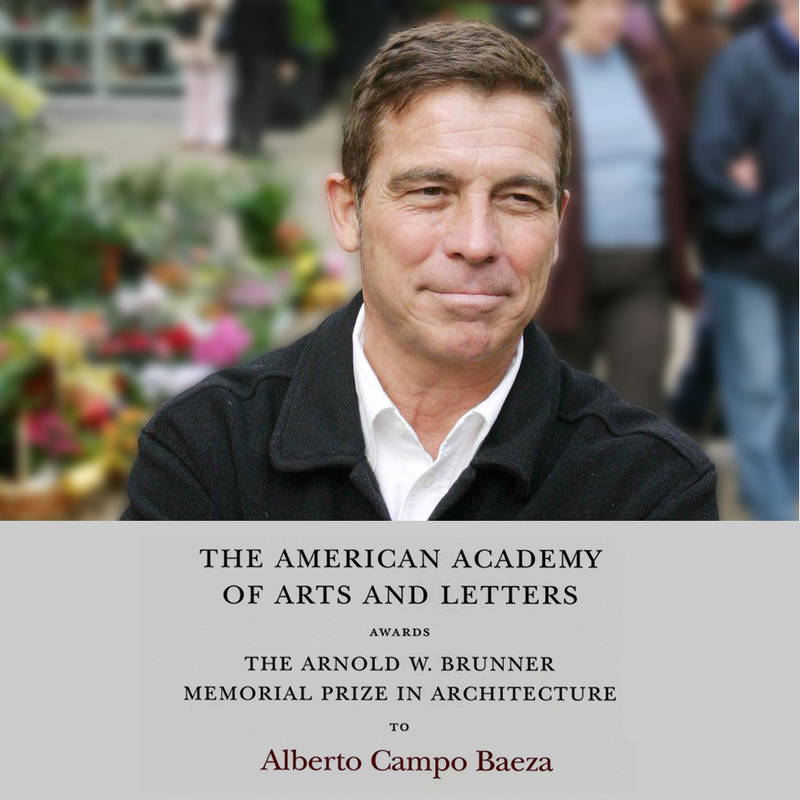 Inaugurated in 1955, the American Academy of Arts and Letters bestows the annual Arnold W. Brunner Memorial Prize in Architecture on “an architect who has made a significant contribution to architecture as an art”. 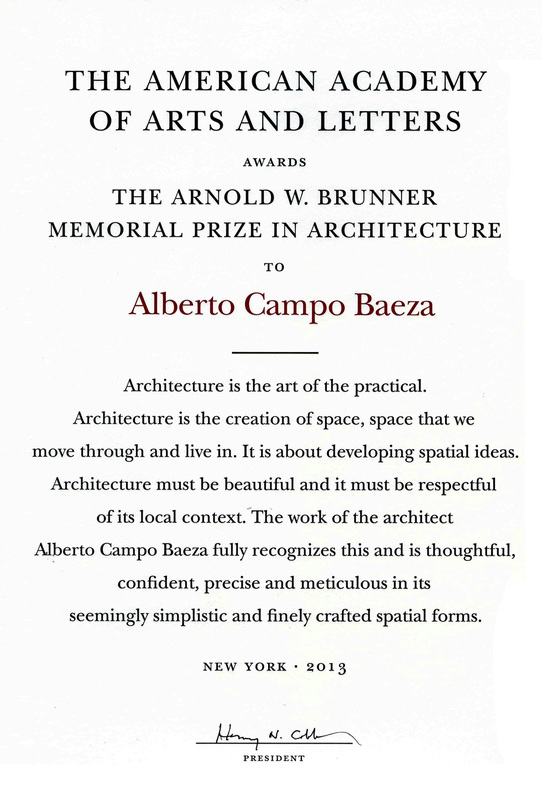 Alberto Campo Baeza is an architect and professor at the Madrid School of Architecture since1986. 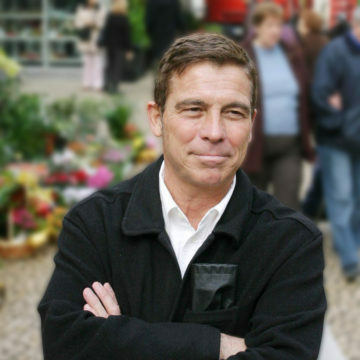 He has taught at the ETH in Zurich, the EPFL in Lausanne, at the University of Pennsylvania in Philadelphia and during the present academic year at the CUA in Washington. 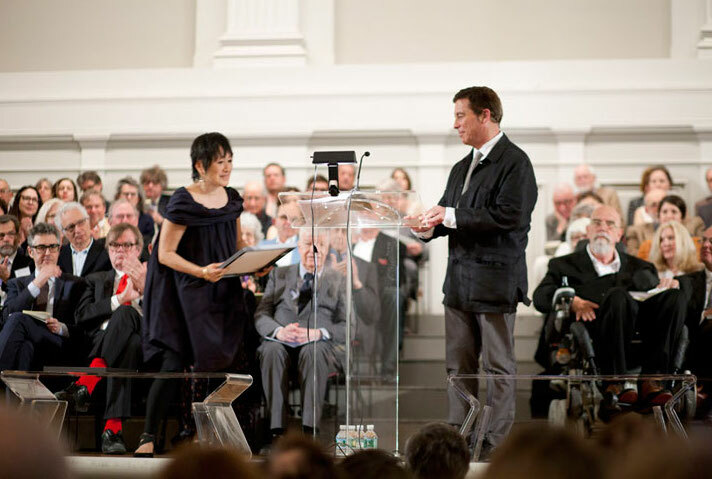 He has also taught at numerous other prestigious schools of architecture around the world. His work, described as uncompromising, sober and essential, has received international acclaim and renown. His writings have been published in various books with an international circulation. He believes in Architecture as a built idea. And he claims that the two main components of Architecture are gravity that builds space and light that builds time. 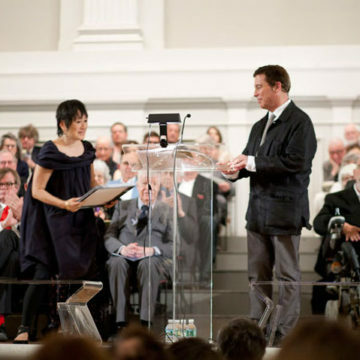 His work has been exhibited at Mies’s Crown Hall in Chicago, Palladio’s Basilica in Vicenza, the former Urban Center in New York, the Basilica Santa Irene in Istanbul, the prestigious Gallery TOTO in Tokyo, at Bramante’s Tempietto as well as the MAXXI in Rome and at last year’s Venice Biennale.